See an example of a spermatocytic seminoma depicted in the histologic image shown below. At low power, the tumor shows a sharp demarcation to the testicular parenchyma, which is edematous. 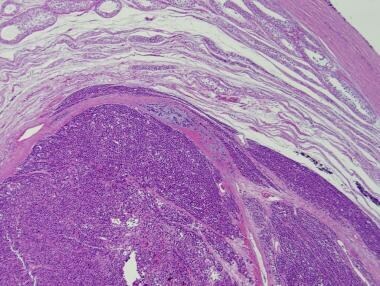 There are subtle fibrous bands within the tumor. The primary tumor site is limited to the testis and, unlike classic seminoma, spermatocytic seminoma has never been reported as primary at extragonadal sites. Bilateral involvement occurs in less than 5% of cases and is usually asynchronous. [11, 12, 13] They rarely involve the rete testis and may compress the epididymis without invading it. Nodules of diffuse sheets of cells in spermatocytic seminoma are usually interspersed by edema. If extensive, the edema can give rise to a nested, pseudoglandular or trabecular pattern. Fibrous septa, clear cytoplasm and associated granulomatous reaction, present of classic seminoma, are virtually lacking in spermatocytic seminoma. 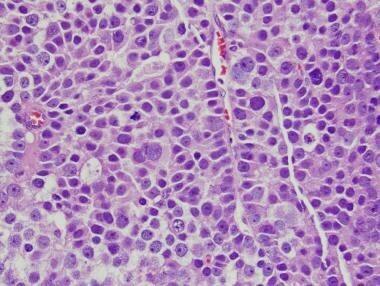 Likewise, lymphoid infiltrate is scant to absent, and usually limited to a perivascular distribution at the periphery of the tumor. See the images below. 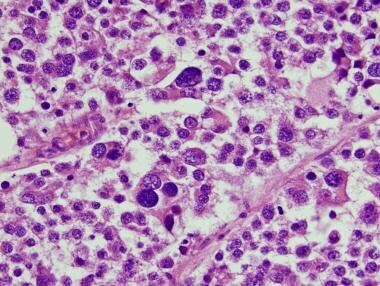 The tumor cells are displayed in sheets that are loosely cohesive in a mucoid stroma. The vascularity can be prominent. 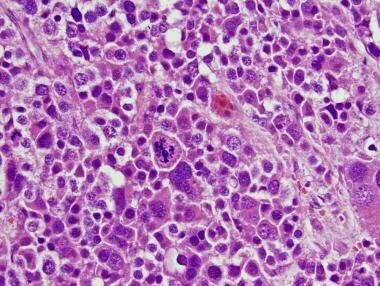 Although the typical lymphocytic infiltrates of the classic seminoma is usually absent, one can usually find focal clusters of small lymphocytes. The most distinctive feature of spermatocytic seminoma is cellular variation. Cells with uniformly round nuclei but with variation in diameter (6-100 µm) are distributed in 3 distinctive populations: small lymphocytelike cells (6-8 µm) with smudged chromatin and slightly more cytoplasm than a lymphocyte; intermediate-sized cells (15-20 µm), the most common cell type; and large cells (50-100 µm), that may be mono- or multinucleated. The chromatin is dense in small cells and filamentous in the intermediate and large ones, with a "spireme" appearance, reminiscent of primary spermatocytes, hence the name. The mitotic rate is often high and apoptosis is prominent. The cytoplasm is eosinophilic to amphophilic and lacks glycogen (periodic acid Schiff [PAS] negative). See the following images. The 3 typical cell types are seen: large and intermediate cells have "spiremelike" chromatin distribution. In this field, one can see striking pleomorphism and an atypical mitosis. Mitoses are usually present, but only seldom exceed 20 per 10 high power fields. In this field, the 3-cell population is noted. In contrast to classic seminoma, the cell borders are indistinct. 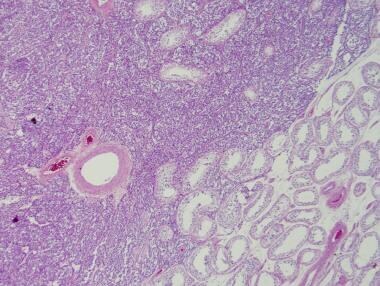 Although spermatocytic seminoma is not associated with IGCNU, intratubular spread is a common finding. In fact, secondary nodules are thought to evolve from invasive cells in foci of intratubular spermatocytic seminoma. The tubules are distended by a polymorphous population of cells that lack the characteristic features of IGCNU. Modified from Sternberg's Diagnostic Surgical Pathology, 4th ed, 2004. GCT = germ cell tumors; IGCNU = intratubular germ cell neoplasia, unclassified; PLAP = placental alkaline phosphatase; TGCT = testicular germ cell tumors. Although classic seminomas originate from an embryonic germ cell, spermatocytic seminomas are likely to originate in a cell farther along the developmental pathway capable of differentiating toward the primary pachytene-spermatocyte stage of maturation. Because of the distinctive meiotic-type chromatin in some cells, it has been proposed that spermatocytic seminomas develop from meiotic cells. Although haploid DNA and lectin-binding studies have failed to demonstrate advanced spermatogenic differentiation,  stage-specific markers for male germ cell development are positive in spermatocytic seminomas but not on other testicular germ cell tumors. Similarly, proteins expressed in gonocytes and spermatogonia are consistently present in spermatocytic seminoma. The image below depicts spread to the testicular parenchyma. In this case, the tumor cells infiltrate around seminiferous tubules and spread to the testicular parenchyma without a capsule or pseudocapsule. It has been hypothesized, however, that apoptosis may play a role in the indolent behavior of spermatocytic seminomas in an analogy to indolent behavior in other tumor systems (notably CD30-positive cutaneous lymphoma, another neoplasm where phenotype and behavior do not match). Significantly greater numbers of apoptotic cells and activated caspase-3-positive cells were found in spermatocytic seminoma compared with usual seminoma. Furthermore, apoptotic parameters were decreased in sarcomatous transformation of spermatocytic seminoma. Young RH. A brief history of the pathology of the gonads. Mod Pathol. 2005 Feb. 18 Suppl 2:S3-S17. [Medline]. Mostofi FK. Tumor markers and pathology of testicular tumors. Prog Clin Biol Res. 1984. 153:69-87. [Medline]. Burke AP, Mostofi FK. Spermatocytic seminoma: a clinicopathologic study of 79 cases. J Urol Pathol. 1993. 1:21-32. Carriere P, Baade P, Fritschi L. Population based incidence and age distribution of spermatocytic seminoma. J Urol. 2007 Jul. 178(1):125-8. [Medline]. Haroon S, Tariq MU, Fatima S, Kayani N. Spermatocytic seminoma: a 21 years' retrospective study in a tertiary care hospital in Pakistan. Int J Clin Exp Pathol. 2013. 6(11):2350-6. [Medline]. Chung PW, Bayley AJ, Sweet J, et al. Spermatocytic seminoma: a review. Eur Urol. 2004 Apr. 45(4):495-8. [Medline]. Reuter VE. Origins and molecular biology of testicular germ cell tumors. Mod Pathol. 2005 Feb. 18 Suppl 2:S51-60. [Medline]. Waheeb R, Hofmann MC. Human spermatogonial stem cells: a possible origin for spermatocytic seminoma. Int J Androl. 2011 Aug. 34(4 Pt 2):e296-305; discussion e305. [Medline]. Lim J, Goriely A, Turner GD, Ewen KA, Jacobsen GK, Graem N. OCT2, SSX and SAGE1 reveal the phenotypic heterogeneity of spermatocytic seminoma reflecting distinct subpopulations of spermatogonia. J Pathol. 2011 Aug. 224(4):473-83. [Medline]. Stoop H, van Gurp R, de Krijger R, et al. Reactivity of germ cell maturation stage-specific markers in spermatocytic seminoma: diagnostic and etiological implications. Lab Invest. 2001 Jul. 81(7):919-28. [Medline]. Bomeisl PE, MacLennan GT. Spermatocytic seminoma. J Urol. 2007 Feb. 177(2):734. [Medline]. Maruta S, Shida Y, Takehara K, Onita T, Igawa T, Sakai H. [A case report of bilateral spermatocytic seminoma]. Hinyokika Kiyo. 2011 Sep. 57(9):525-8. [Medline]. Xu N, Li F, Tian R, Shao M, Liu L, Guo K. A rare case of bilateral sequential spermatocytic seminoma. World J Surg Oncol. 2013. 11(1):175. [Medline]. True LD, Otis CN, Delprado W, Scully RE, Rosai J. Spermatocytic seminoma of testis with sarcomatous transformation. A report of five cases. Am J Surg Pathol. 1988 Feb. 12(2):75-82. [Medline]. Dundr P, Pesl M, Povysil C, et al. Anaplastic variant of spermatocytic seminoma. Pathol Res Pract. 2007. 203(8):621-4. [Medline]. Albores-Saavedra J, Huffman H, Alvarado-Cabrero I, Ayala AG. Anaplastic variant of spermatocytic seminoma. Hum Pathol. 1996 Jul. 27(7):650-5. [Medline]. Mikuz G. [Spermatocytic seminoma : A tumor with many faces]. Pathologe. 2014 May. 35(3):232-7. [Medline]. Trivedi P, Pasricha S, Gupta A. Spermatocytic seminoma associated with undifferentiated sarcoma: a rare case report. Indian J Pathol Microbiol. 2011 Jan-Mar. 54(1):138-40. [Medline]. Saran RK, Banerjee AK, Gupta SK, Rajwanshi A. Spermatocytic seminoma: a cytology and histology case report with review of the literature. Diagn Cytopathol. 1999 Apr. 20(4):233-6. [Medline]. Ulbright TM. Mill SE, ed. Sternberg's Diagnostic Surgical Pathology. 4th ed. Philadelphia, Pa: Lippincott, Williams & Wilkins; 2004. Cummings OW, Ulbright TM, Eble JN, Roth LM. Spermatocytic seminoma: an immunohistochemical study. Hum Pathol. 1994 Jan. 25(1):54-9. [Medline]. dos Santos NR, Torensma R, de Vries TJ, et al. Heterogeneous expression of the SSX cancer/testis antigens in human melanoma lesions and cell lines. Cancer Res. 2000 Mar 15. 60(6):1654-62. [Medline]. Kao CS, Badve SS, Ulbright TM. The utility of immunostaining for NUT, GAGE7 and NY-ESO-1 in the diagnosis of spermatocytic seminoma. Histopathology. 2014 Jul. 65(1):35-44. [Medline]. Eble JN. Spermatocytic seminoma. Hum Pathol. 1994 Oct. 25(10):1035-42. [Medline]. Rajpert-De Meyts E, Jacobsen GK, Bartkova J, et al. The immunohistochemical expression pattern of Chk2, p53, p19INK4d, MAGE-A4 and other selected antigens provides new evidence for the premeiotic origin of spermatocytic seminoma. Histopathology. 2003 Mar. 42(3):217-26. [Medline]. Verkerk AJ, Ariel I, Dekker MC, et al. Unique expression patterns of H19 in human testicular cancers of different etiology. Oncogene. 1997 Jan 9. 14(1):95-107. [Medline]. Rosenberg C, Mostert MC, Schut TB, et al. Chromosomal constitution of human spermatocytic seminomas: comparative genomic hybridization supported by conventional and interphase cytogenetics. Genes Chromosomes Cancer. 1998 Dec. 23(4):286-91. [Medline]. Looijenga LH, Hersmus R, Gillis AJ, et al. Genomic and expression profiling of human spermatocytic seminomas: primary spermatocyte as tumorigenic precursor and DMRT1 as candidate chromosome 9 gene. Cancer Res. 2006 Jan 1. 66(1):290-302. [Medline]. Matoska J, Ondrus D, Hornak M. Metastatic spermatocytic seminoma. 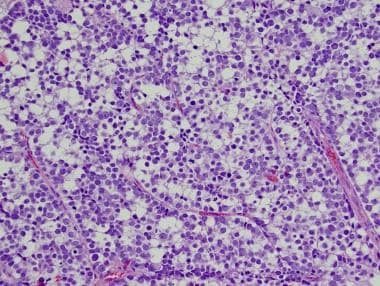 A case report with light microscopic, ultrastructural, and immunohistochemical findings. Cancer. 1988 Sep 15. 62(6):1197-201. [Medline]. Steiner H, Gozzi C, Verdorfer I, Mikuz G, Bartsch G, Hobisch A. Metastatic spermatocytic seminoma--an extremely rare disease. Eur Urol. 2006 Jan. 49(1):183-6. [Medline]. Steiner H, Gozzi C, Verdorfer I, Mikuz G, Bartsch G, Hobisch A. Metastatic spermatocytic seminoma--an extremely rare disease: Part 2. Eur Urol. 2006 Feb. 49(2):408-9. [Medline]. Wetherell D, Lawrentschuk N, Gyomber D. Spermatocytic seminoma with sarcoma: an indication for adjuvant chemotherapy in localized disease. Korean J Urol. 2013 Dec. 54(12):884-7. [Medline]. Sharmeen F, Rosenthal MH, Howard SA. The management of retroperitoneal lymphadenopathy in spermatocytic seminoma of the testicle. Clin Imaging. 2014 Mar-Apr. 38(2):202-4. [Medline]. Raiss GG, Andaloussi MM, Raissouni SS, Mrabti HH, Errihani HH. Spermatocytic seminoma at the National Institute of Oncology in Morocco. BMC Res Notes. 2011 Jun 29. 4:218. [Medline]. Bishop EF, Badve S, Morimiya A, Saxena R, Ulbright TM. Apoptosis in spermatocytic and usual seminomas: a light microscopic and immunohistochemical study. Mod Pathol. 2007 Oct. 20(10):1036-44. [Medline].